When it comes to geeking out, local comedy giants, Jason, Donovan, and Nicholas Goliath seem to have more love to give than we thought! 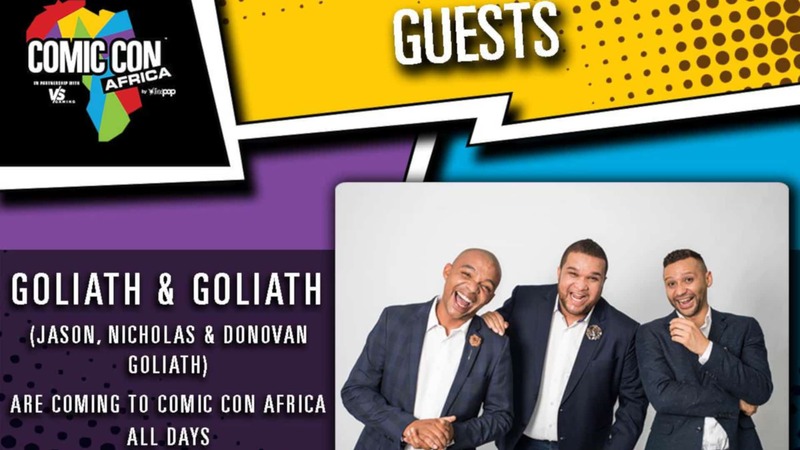 The Goliath Trio will be at Comic-Con, acting as the official Masters of Ceremony (MC) for various events spanning the convention. ReedPOP, Reed Exhibitions Africa, and VS Gaming have all confirmed that all Goliaths will take on different roles, including the MC roles, and host various autographic sessions throughout the weekend. Reed Exhibitions also states that audiences will get to engage with the comedians (in exactly what capacity, remains to be seen). Between the three of them, there is more than enough experience to go around. Jason Goliath, for one, has more than 10 years of professional emcee experience and is one of the most recognisable comedians in South Africa at the moment. Donovan Goliath, on the other hand, came straight out of an advertising job, which he gave up to pursue comedy. Nicholas, however, is as good of a household name as any other stand-up comedian with their name on the walk of fame. Nick is the host of Beat that Price. Comic-Con Africa is a nationwide first. While similar conventions have been held in the past, ReedPOP, Reed Exhibitions Expo and VS Gaming will all host the very first official South African Comic-Con on 14 September to 16 September 2018. It will be held at the Kyalami Grand Prix Circuit & International Convention Centre. Vamers will be there to check it out and to hang out with fans. We will be covering all aspects of Comic-Con, and hope to see you there!